IKE Nominated as a National Blue Ribbon School! 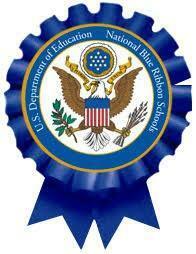 Eisenhower El Sch has been nominated by Pennsylvania to join the esteemed community of National Blue Ribbon Schools. National Blue Ribbon Schools are public and non-public elementary, middle, and high schools that are producing outstanding results for all students. They have demonstrated consistent excellence, and made progress in closing gaps in student achievement. The National Blue Ribbon Schools recognition program is part of a larger U. S. Department of Education effort to identify and disseminate knowledge about effective school leadership and promising instructional practices. Eisenhower Elementary was nominated as an Exemplary Achievement Gap Closing Schools. For more information about award criteria and eligibility, please visit the U.S. Department of Education Eligibility and Criteria website. Since its inception in 1982, the National Blue Ribbon Schools Program has recognized more than 8,800 Great American Schools. Each year, representatives of newly recognized schools gather for a ceremony in Washington, DC where their achievement is officially honored by the U.S. Department of Education. This prestigious award galvanizes school communities and generates inspiring school success stories for the media. It also draws professional and public interest and offers recipients new opportunities to share their hard-won knowledge in districts, states and beyond. Up to 13 outstanding public schools can be nominated from Pennsylvania for the National Blue Ribbon Schools award. Indiana Area School District © 2019. All Rights Reserved.